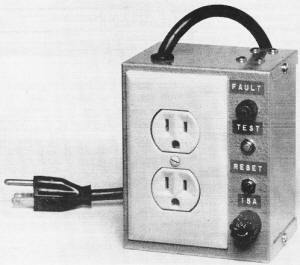 When I first started working as an electrician apprentice in the summer of 1974 as part of my high school vocational program, ground fault interrupter (GFI) receptacles and circuit breakers were not mandated by the National Electric Code (NEC). It was only a little more than a decade earlier that UC Berkeley professor Charles Dalziel invented the GFI circuit while researching the effects of electrical current on humans (electrocution). By the late 1970s, shortly before I enlisted in the USAF to begin my electronics career, GFI (now referred to as GFCI) protection was required for areas near water like in bathrooms and outside. Nowadays the NEC calls for GFIs in bathrooms, kitchens, garages, outdoors, and any place where wet or damp conditions might exist. In Arc Fault Circuit Interrupters (AFCI) have been required on may types of circuits since 1999. AFCIs detect the presence of arcing and open the circuit if present. 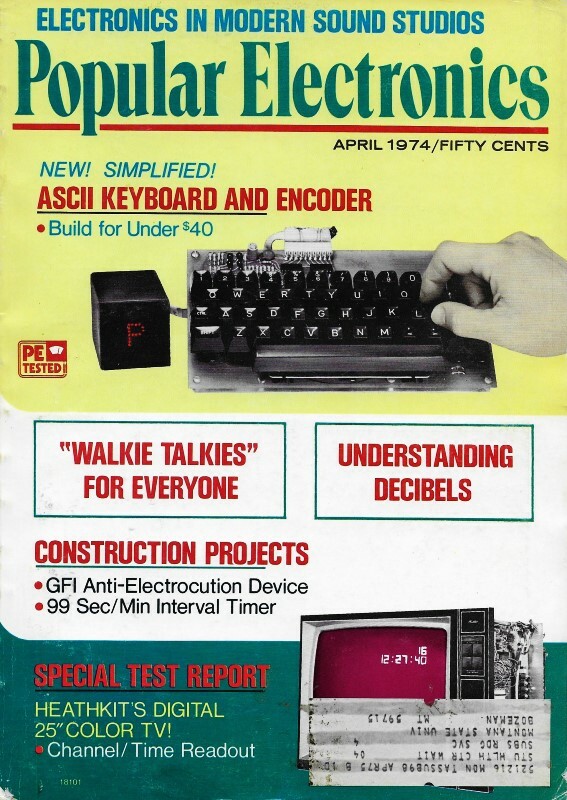 Early AFCI devices were notoriously overly sensitive and often tripped on imperfect but safe vacuum cleaners, kitchen blenders, and hair dryers. Proposed 2017 NEC requirements for GFCI and AFCI circuit applications have been greatly expanded - undoubtedly due partly to the successful lobbying efforts of device manufacturers. The cost for new homes will increase accordingly. Melanie's sister and her husband had a big new house built a couple years ago and while we were visiting, they complained about a new humidifier that was not working anymore. I traced the cause to the AFCI breaker in the panel. After resetting it and turning the dehumidifier back on, it tripped after a couple minutes. BTW, I've told the story before about a high school friend of mine who died as the result of electrocution when he was using one of the old metal-framed circular saws in a damp, dirt floor shed. He was reportedly building a bookshelf as a graduation present for his girlfriend. A GFI-protected circuit probably would have saved him. For that matter, the relatively new (circa 1976) double-insulated (i.e. plastic) framed power tools might have saved him as well, even without a GFI breaker. Other RF Cafe resources on electrocution: Eliminate Risk of Fatal Electric Shock with the GFI | Mac's Service Shop: Electric Shock | Potential Neutral Conductor Hazards | Electrocution of the Human Body | Biological Effects of Electrical Shock | Resuscitation for Electric Shock | Electrical Shock: Fact and Fiction | Look Out! It's Hot! Have you ever used a power tool outdoors while standing on wet ground? Do you have a swimming pool with electrical equipment (or an ac radio) nearby? How about using an electric lawn mower on a damp lawn on a hot day and taking your shoes off? Every time you let your body make good contact with a ground (whether it is the earth itself or a pipe or other metal object that is grounded) and, at the same time, use a power tool or other electric equipment, you expose yourself to a possible electric shock which can be fatal if the current is sufficiently high and you can't let go in time. That's why many people today are using ground fault interrupters (GFI's) on their electrical equipment. There are commercial devices available, but you can build your own GFI easily and at low cost. The GFI is connected between the power line and the appliance. The device described here senses ground (leakage) currents of about 2 mA and automatically turns off the primary power within 30 milliseconds. This provides protection at a sufficiently low current and in a sufficiently short time to prevent serious shock injury. Of course, if the leakage current occurs, the apparatus is shut down, whether someone is touching it or not. Fig. 1. When the secondary of T1 senses an imbalance in the two power-line feeds, the difference is amplified and turns on SCR1, which cuts the power to the socket. Circuit Operation. The main sensing element of the ground-fault interrupter (see Fig. 1) is transformer T1. It consists of a ferrite core with the two power lines wound around it to form the primary windings and a secondary winding of #29 enameled wire. The transformer does not respond to power consumed by the load but is extremely sensitive to unequal currents in the two power lines. This would he the case if there were leakage to ground through any device plugged into SO1. The transformer compares the current in the two sides of the line and, if they are not the same, induces a voltage in the secondary winding. If there is no leakage, and no voltage in the secondary of T1, the power supply goes through the contacts of relay K1. When there is a voltage induced in the secondary of T1, it is compared in IC1 to a reference voltage applied to pin 3. When the generated voltage, applied to pin 2, is high enough, the output of IC1 drives the gate of SCR1 positive so that it turns on and energizes the relay. This cuts oft the power line and turns on the fault indicator lamp. Since SCR1 is powered by a rectified and filtered dc, it remains on until the reset pushbutton (S2) is operated. The fault that caused the power-line imbalance must then be corrected before the protection system is enabled again. Resistor R12 and test switch S1 are included to. produce a low current imbalance (about 2 mA) and should be operated before each use of the system to be sure that it is operating properly. After testing, of course, the reset button must be pushed. Construction. The circuit can be assembled very easily on perf board and mounted in any suitable chassis. The test and reset switches, fault indicator light, and fuse should be mounted on the front panel. If the chassis is metal, be sure that no part of the circuit is contacting the chassis. Also be sure that the ground lead of SO1 and the green lead of the three-way power line are connected to the metal chassis. 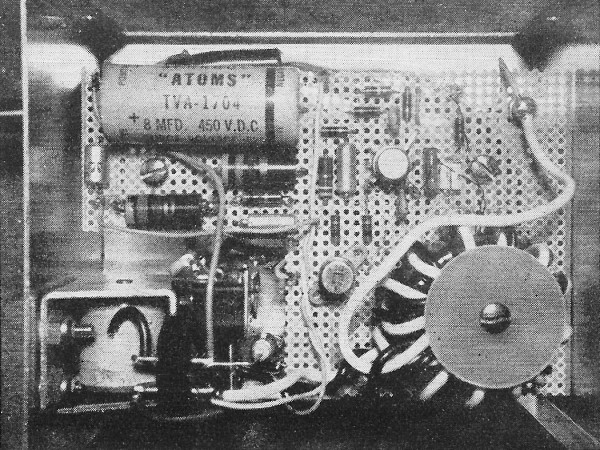 Component layout of the prototype. The perforated board is mounted on the chassis with two 1 1/2-in. aluminum standoffs, and the same two holes are used for output socket. 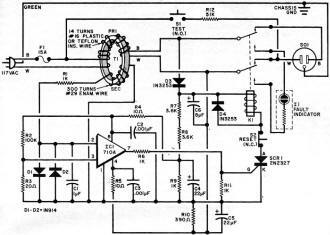 The relay specified has 10-ampere (1200-watt) contact ratings, which should be sufficient for most purposes. If higher contact ratings are required, be sure that the current required by the relay coil is below 20 mA and above 5 mA. The core of the transformer is a Ferrox-cube K300501-3E. Wind 300 turns of #29 enameled wire through the toroid to form the secondary, leaving long lead ends. Then cover this winding with a layer of plastic insulating tape. To form the primary, use a twisted pair of #16 plastic or Teflon insulated wires and wind 14 turns through the toroid and over the secondary winding. The finished transformer can be supported on the perf board with a long screw and a pair of large insulated (plastic) washers. Use. Be sure to perform the operating test by depressing the test button and noting that the relay operates and the fault indicator lamp comes on. Then press the reset switch. 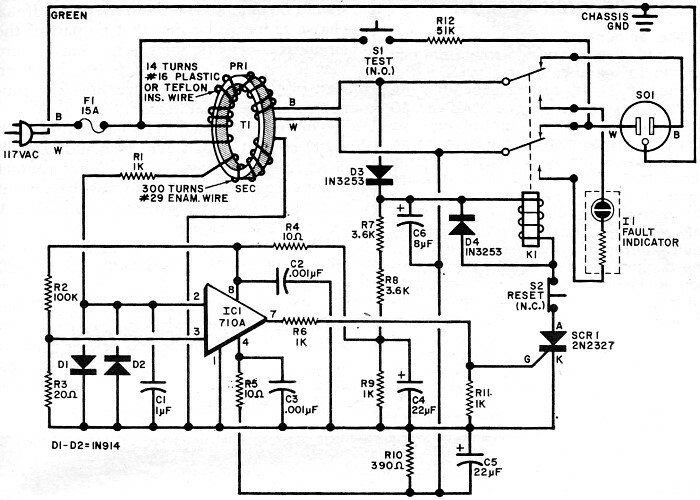 The circuit shown here is for three-wire electrical systems - which everyone should have. However, two-wire appliances can be plugged into the fault interrupter to take advantage of its protection. The amount of current that the human body can withstand varies from one person to another. Generally, at a frequency of 60 Hz, current above 0.5 mA produces some sensation. At 10 or 20 mA, voluntary muscle control may be lost and the person is unable to let go of the current-carrying object. Slightly above that, the victim's chest muscles contract and breathing stops as long as the current persists. The equivalent 2-mA level required to trip the ground-fault interrupter described here is below the dangerous level for an average person, including a child. It is essential to mention that, while the ground-fault interrupter will protect a person from current flowing from the appliance through him to ground, it will not protect him if he gets directly across the power line. This must be avoided at all times.